OMG!!! WE FORGOT TO ADD A DESCRIPTION FOR THE NEW FURNITURE IN THE LANG FILES!!! In this tutrial we will create a furniture which will be able to craft some krapfen for us (I know the sprite is not a Krapfen, but I know you can get over it). After having done this we will be able to craft such a furniture in game and use it to craft krapfens! Yum! Please refer to the Player Effects Modding Reference for a full reference about all of the properties exposed in this file and to the ADDING A NEW ITEM TO THE GAME for a quick tutorial about the basics of item modding in Hard Times. "value": "I made this awesome Krapfen by following a guide on the official Hard Times wiki! Thake that!" Please remember that “-DESCRIPTION” is a suffix that the game uses for looking after description of game items. So for every item id entry in the lang file the game expects to exist also a itemId-DESCRIPTION entry. Now that we have a brand new item in game, we can go on and create our crafting recipe list that we will use with the crafting forniture to add a crafting furniture in game. 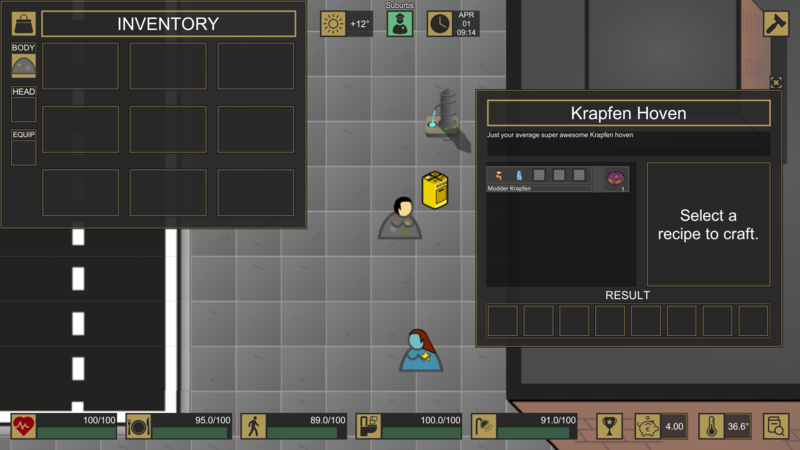 Now we will tackle with a new concept in Hard Times modding: Crafting Recipes. Please note that the name of the file is arbitrary and doesen't matter to the game. Please refer to the Crafting Recipes Reference page for a full explaination of all the properties exposed in this file. In this file you can note a “collectionId” value, which indicates a uniquie id to refer this collection. After that we just have a list of available recipes. Each one has a recipeId, a duration expressed in minutes game time, a “isPublic” flag, indicating if the recipe will be readily accessible to the player as the game starts or if it will be locked until a proper book has been read to unlock it. In that case we will need to add or edit a proper book item. As you can see each recipe has also one or more result items, each one with a quantity property to indicate how many of the items to spawn. Also we have a “ingredients” list containing the required ingredients for the recipe to be succesful. Please note that the quality of the resulting item will be equal the average quality of all of the ingredients and the quality of the crafting device used. Now we have a new FoodItem and a recipe to create it. Next step we will create a furniture to implement this Recipes collection and to make in game crafting possible. Ok, now that we prepared the proper item and crafting recipe we will go on to create a furniture hoven that will craft for us many tasteful krapfens, given that we have all of the required crafting ingredients. "stringValue": "Base Krapfen Hoven Description"
For a full explanation of all of the furnitures properties please refer to the Crafting Furnitures Reference. Note how we referenced the proper recipes collection in the recipesCollection extra property. The craftingPaletteModule should remain as it is since it's not meant to be changed. In the linkedFurnitureId extra parameter we referenced the linked furnitureId. 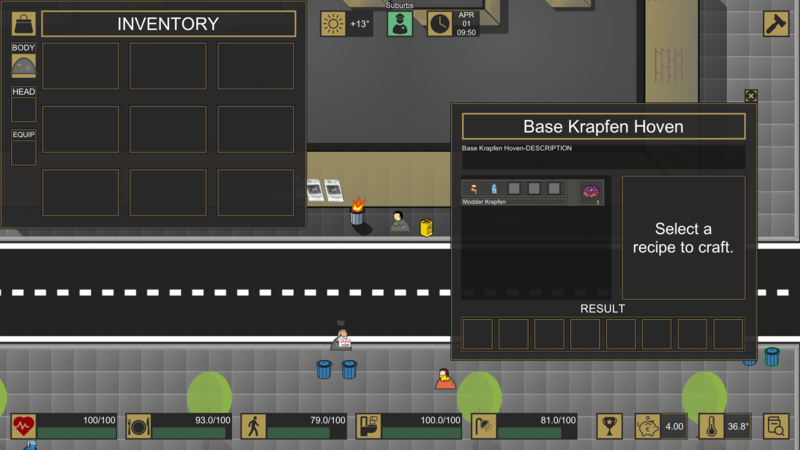 "value": "A beautiful Krapfen Hoven made thanks to the modding guides in the official Hard Times wiki!" Lastly to have access to the newly created furniture we will put it on sale in the same Metro Shop we used for a previous guide. We can also create a proper crafting recipe for it and place it in some existing crafting recipes collection (such as the one of the workbench for example). Note that we put it for sale for only one euro. It's cheap so that it will be easy for you to buy it a test it. Then you could come back here and raise the price as you wish. 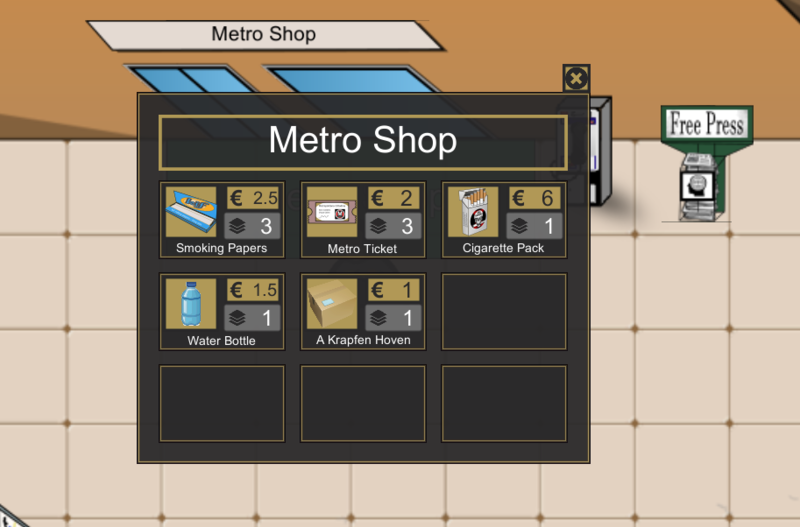 Just enter any metro stations and look in the Metro Shop for the Krapfen hoven for sale. Please keep in mind that you are not guaranteed to find it at first try. Items in shop cycle randomly and you may not find what you are looking for at first. "value": "Just your average super awesome Krapfen hoven"
Please note that we used the panelTitle of the furniture as a key. Now all is in place, and your average zombie cop looks satisfied as well!